— Professor Robert Garland speaks about the adventurous start to his career at Colgate during his convocation speech to the Class of 2021. Green fieldwork. Under the guidance of Professor Andy Pattison, students are performing a community-wide greenhouse gas inventory of the Town of Hamilton, according to the Observer-Dispatch (Utica, N.Y.). 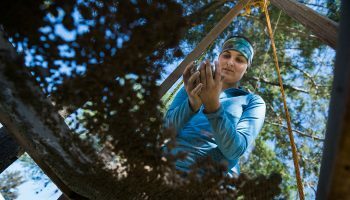 Through the fall class Community-based Study of Environmental Issues, students get real-world experience while helping the community address climate change locally. The inventory is part of the state-supported Climate Smart Communities program. —Technical Sergeant Leialoha Mara on professors Alex Nakhimovsky, Ulrich Meyer, and Ed Witherspoon, all of whom received Patriot Awards from the Employer Support of the Guard and Reserve. The awards are in recognition of their support of Mara, who is an administrative assistant at Colgate and is taking university classes while serving in the Air National Guard at the Eastern Air Defense Sector in Rome, N.Y.
Shaking things up. Assistant Professor of Geology Aubreya Adams, along with nine other investigators, received a grant from the National Science Foundation to help deploy the largest collection of seismometers ever installed along the Alaskan Peninsula. The experiment will give us a better understanding of earthquakes and volcanic eruptions. With the appointment of Tracey Hucks ’87, MA’90 as provost and dean of the faculty last summer, President Brian W. Casey’s cabinet is officially full. 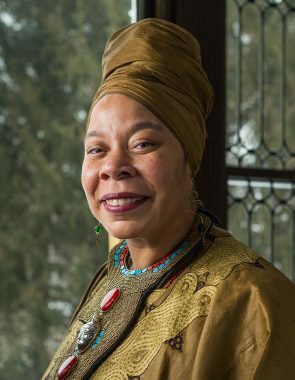 Hucks, a nationally regarded scholar of American religious history and Africana studies, returned to her alma mater after a professorship at Davidson College. 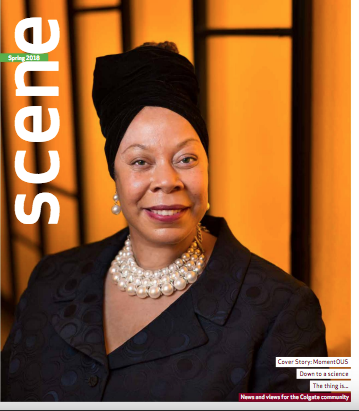 There she was the James D. Vail III Chair of the Africana studies department, affiliated faculty in the religion department, and a member of the advisory committee of Davidson’s Center for Interdisciplinary Studies. Prior to joining the Davidson faculty in 2014, Hucks was a professor at Haverford College for more than 15 years and served, on multiple occasions, as chair of the Department of Religion. She earned her PhD from Harvard University in 1998 in religious studies, with a scholarly focus on the religions of Africa and the Americas. The other most recent appointment is Paul J. McLoughlin II as the vice president and dean of the college. Formerly dean of students at Lafayette College, McLoughlin’s experience includes overseeing residential life, recreation services, student conduct, wellness, student leadership and involvement, fraternity and sorority advising, and numerous other campus life initiatives. 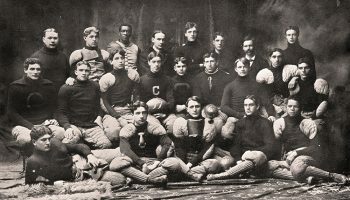 Before joining Lafayette, McLoughlin held a series of positions at Harvard University, finishing as associate dean of Harvard College and senior adviser to the dean of Harvard College. Rounding out the rest of the president’s cabinet are: Victoria M. Chun ’91, MA’94, vice president and director of athletics; Steve Fabiani, vice president and chief information officer; Murray Decock ’80, senior vice president for external relations, advancement and initiatives; Joseph S. Hope ’97, senior vice president for finance and administration and chief investment officer; Laura H. Jack, vice president for communications; Gary L. Ross ’77, vice president and dean of admission and financial aid; Robert L. Tyburski ’74, vice president and senior adviser, secretary to the Board of Trustees; and Christopher Wells, senior adviser to the president. Residents of Madison County and students of Colgate University and other nearby colleges now have access to a newly launched Sexual Assault Nurse Examiner (SANE) Program at Community Memorial Hospital. 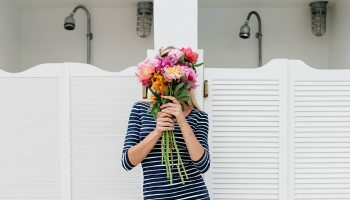 This initiative — a collaboration among Colgate, the hospital, and Madison County’s Liberty Resources/Help Restore Hope Center — provides five specially trained nurses to offer comprehensive medical and psychological services specifically related to sexual assault for all residents of Southern Madison County. It continues an ongoing effort by the university to improve education, prevention, and response to sexual assault. 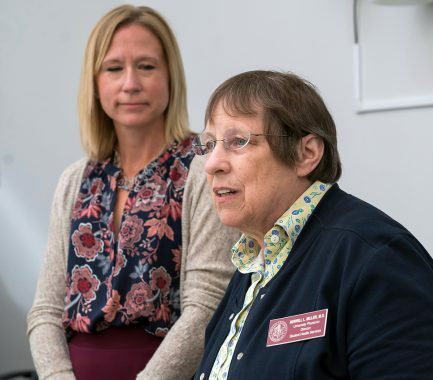 Colgate Director of Student Health Services Dr. Merrill Miller said the program has been in development since 2016 and is a direct result of student feedback and a commitment on behalf of Colgate’s Board of Trustees. Colgate has contributed about $125,000 toward the initiative, which includes the purchase of new equipment and specialized training for responding nurses. In addition to the newly launched SANE Program, Colgate has made Haven Plus — a supplemental sexual violence prevention training course required for student athletes and student organization leaders — available to all students. 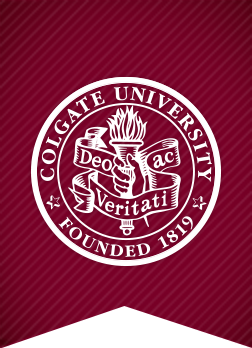 “Reporting and encouraging others to report helps ensure survivors have access to resources, understand their options, and helps us eliminate sexual violence at Colgate,” said Vice President and Dean of the College Paul J. McLoughlin II. “She had bobble heads of every Supreme Court justice on her fireplace,” Molly Diamondstein ’18 remembered about Justice Ruth Bader Ginsburg, whom she had the opportunity to meet at the end of her off-campus study experience in Washington, D.C., last spring. Diamondstein described the life-changing meeting at the annual Story Slam on September 18 in Donovan’s Pub. Hosted by the Office of Off-Campus Study, the event invites students to share their study abroad memories, mishaps, and adventures. A political science major, Diamondstein was finishing her semester with the D.C. study group when her boss asked her how she wanted to conclude her internship in the Supreme Court clerk’s office. Diamondstein’s answer? She wanted to play basketball on the Supreme Court basketball court — “the highest court in the land”— and meet Ginsburg. Diamondstein did not expect anything to come of her request, so she was thrilled when her boss set up a one-on-one meeting for her in the justice’s chambers. David Zavallos ’19 and Freesia Ferrantino ’19, who also spent a semester in Washington, D.C., with Professor Michael Hayes, described meeting Joe Biden on the steps of Congress and seeing the president and vice president in the halls of the West Wing. While some students’ stories were about being in the right place at the right time, others’ were about the intensive learning experience. Andrew DeFrank ’18 traveled to Argentina with the School for International Training’s Human Rights and Social Movements program. After a semester of immersion in Buenos Aires, DeFrank wrote a 40-page research paper in Spanish. In addition to the Story Slam, the Office of Off-Campus Study hosted a brown bag lunch series in September with panel discussions about unpacking a semester abroad. Topics included leveraging off-campus study in career planning, negotiating cultural differences and identity abroad, and how to go abroad again. Constitution Day is among America’s lesser-known national holidays. 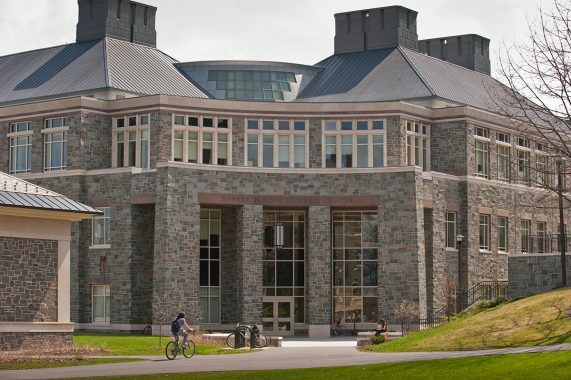 Colgate’s Center for Freedom and Western Civilization wants to change that. Each year the center hosts a Constitution Day debate in which experts discuss constitutional issues of the 21st century. Past years have featured debates on free speech, immigration policy, and NSA surveillance. This year, the September 19 event focused on the legacy of late Supreme Court Justice Antonin Scalia. Known for his conservative politics and big personality, Scalia cuts a controversial figure. The debaters were Ralph A. Rossum, a professor at Claremont McKenna College, and Bruce Allen Murphy, a professor at Lafayette College. Both are constitutional law professors and authors of books on Scalia’s jurisprudence. Colgate political science professor Stanley Brubaker moderated the debate. In addition to the debaters sharing their opinions on Scalia’s legacy, the pair also disclosed details of their personal interactions with the late “Nino” Scalia. According to Rossum, Scalia ultimately followed his own advice, acting as an impartial voice on behalf of the Constitution, issuing rulings with sometimes liberal outcomes. Murphy, however, turned to an analysis of Scalia’s traditional Catholic upbringing, and criticized how this background led to his deeply partisan conservative judicial view. Students leaving the debate took with them a new knowledge of constitutional law — and also a free pocket copy of the Constitution. A history professor at Birkbeck College at the University of London, Bourke recently delivered the lecture “Dum-Dum Bullets: The ‘Savage’ and the ‘Civilised.’” The next evening, she met with a group of students and professors to discuss her recent books, Fear: A Cultural History and The Story of Pain: From Prayer to Painkillers. During the Peace and Conflict Studies workshop, Bourke discussed her interests, her research methods, and how her findings may affect how we look at current events. Bourke knew that fear and pain were central to her existence at that time. But, as Woolf describes, Bourke found that she didn’t have the words to explain her intense emotions. She decided to explore this disconnect. 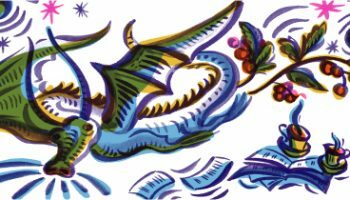 In her books, she tracks the history of fear and pain and the language we use to describe them. Because pain and fear are societal and political, Bourke argues that they can be unifying. Pain can act as an “emotional contagion,” where the empathy of entire communities can manifest physically. Similarly, fear has united communities in the 1960s hippy movement, feminist movements, the Climate March, and Black Lives Matter. It’s hard to beat the beauty of autumn in central New York. Leaf peepers from the Hamilton community took a two-day fall foliage bus tour across eastern New York and Bennington, Vt. Along the way, they toured the Saratoga Auto Museum and the New York State Military Museum and Veterans Research Center in Saratoga Springs, N.Y. 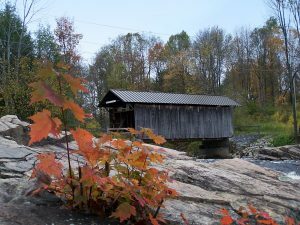 They also visited several famous covered bridges, including Salisbury Center (N.Y.) Covered Bridge; Eagle Mills Covered Bridge (Broadalbin, N.Y.); and Hyde Hall Covered Bridge (Cooperstown, N.Y). Other highlights included the Hyde Hall Mansion in Cooperstown and a 100-year-old water wheel in Broadalbin. Hungry brunchgoers packed the Good Nature Farm Brewery to watch Nancy Fuller, upstate New York native and host of Food Network’s Farmhouse Rules, prepare a mouthwatering meal with locally sourced ingredients on July 30. “You have a phenomenal town,” Fuller said to the crowd, cracking farm-fresh eggs into a sizzling pan. “You have the best farmer’s market in the little town square that I’ve ever been to.” Adding butter (churned at nearby Kriemhild Dairy Farms), chives, goat cheese, and mushrooms to the pan, Fuller quickly whipped up a batch of eggs fluffy and flavorful enough to satisfy any morning appetite. As she cooked, Fuller answered questions from the audience — sharing that she learned to cook from her grandmother and admitting that she usually doesn’t follow recipes exactly. The demonstration was followed by a meet-and-greet and book signing for Fuller’s cookbook Farmhouse Rules: Simple, Seasonal Meals for the Whole Family. Hamilton’s newest eatery, 8 Fresh, opened the doors to its 22 Utica Street storefront in late August to reveal vibrant green and orange walls and an even more colorful menu. The restaurant offers a fusion of Tex-Mex favorites, salads and wraps, and Middle Eastern sides, including tzatziki and tabouli. In addition to its quirky cuisine-blending fare, 8 Fresh also sells local coffee and fresh-baked goods. Leslie Subaldo ’18, Rev. Corey MacPherson, and Emily Kahn ’19 show off their chaplaincy shirts. The idea of meeting your maker can be intimidating. Less so when ice cream is involved. That’s why the chaplaincy’s “Meet Your Maker” welcome event took the form of an ice cream social. 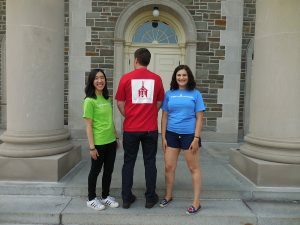 First-year students gathered in the Quad to meet members of Colgate’s religious groups, who sported a rainbow of chaplaincy T-shirts. Student ice cream scoopers donned T-shirts with their religious community’s name on the front and the chaplaincy logo on the back. Each group’s shirt was a different hue: Hindus sported deep purple, Protestants in red, Catholics wore neon green, Jews in blue, Muslims donned dark green, and secular skeptics appeared in fluorescent pink.